Jordan Howard is a good runner. He’s not the best in the game, but he put up a 77.6 PFF rushing grade in 2017, 21st in the league. He finished sixth in rushing yards, tied for third in rushing scores, and only fumbled once. You can do better than Howard as a runner, but you don’t have to. Okay, I’m exaggerating. There are probably linemen who are worse. Or Tom Brady, based on small samples. But for all he’s done as a runner in his first two seasons in the NFL, Howard’s overall value (and overall fantasy value) has been held in check by some seriously subpar pass-catching. We’ve established that drop rate is, year-over-year, not very predictive for wide receivers. The same is basically true for running backs — there have been 312 instances in the PFF era (2007-) of a running back having a qualified number of targets in consecutive years, and the R-squared value of drop rate from Year 1 to Year 2 is 0.05. Fred Jackson dropped 9 of 40 catchable targets in 2010, then 0 of 39 in 2011. So with the caveat that drop rate is inherently small-sample size and makes it difficult to draw large conclusions, and knowing that even in a random set of numbers sometimes something looks like a pattern, there’s this: There have been 13 player-seasons in the data set in which a qualified running back has had a drop rate of 20-plus percent. Two names appear twice: Brandon Jacobs and Jordan Howard. Jacobs did it in 2007 and 2009, but played through 2013, and those were his only two appearances. Howard? Howard’s made the list twice, and he’s done it in his only two years in the league. Howard dropped 8 of 37 catchable targets (21.62 percent drop rate) as a rookie in 2016, then followed that up by dropping 6 of 29 (20.69) last year. To find another back with consecutive years ranking poorly in drop rate, you have to go way down to 31st and 36th on the list, when Reggie Bush notched a 14.63 rate in 2012 and a 14.29 in 2013. 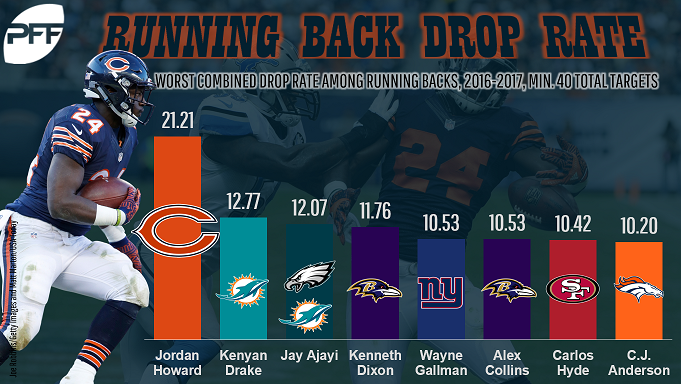 The Bears gave Howard 46 targets as a rookie in 2016, with 33 targets going to other running backs. Last year, with Tarik Cohen in the fold, Howard saw only 31 targets, while other backs saw 93. In 2018, the Bears will be coached by newcomer Matt Nagy, hired away from the Chiefs this offseason. Nagy has already drawn parallels between Cohen and his ex-Chiefs charge, Tyreek Hill. Considering the trends that have already been established in Howard’s passing-game usage and the successful rookie year Cohen just had, it’s fairly safe to assume Howard will have a negligible role in the Chicago passing game in 2018. All that said, Howard should still be a fantasy asset. For all of Cohen’s perks as a receiver and returner, he was decidedly subpar as a ball-carrier, earning only a 68.3 PFF rushing grade (41st among qualified backs). The team doesn’t have any carrier likely to siphon off more than a handful of carries from Howard, and while that might cause worry of the team bringing in a more well-rounded back, perhaps in the draft, the Bears have enough other holes that worrying about replacing a back who has been a RB1 twice in two years just because he isn’t the total package. Howard’s value is going to be higher in standard leagues than PPR, probably for the rest of his career. But even without much receiving ability, he’s just about a lock for 250-plus carries on what should be an improving offense, and that should be enough to keep him as a mid-level RB2 at worst, with upside.